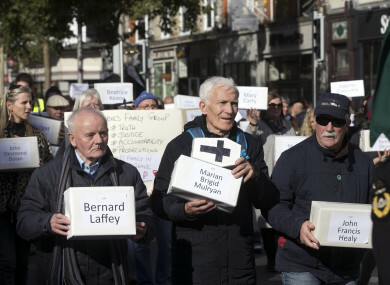 People march carrying boxes representing the victims of those who died in Tuam during a silent procession for the Tuam Babies from Garden of Remembrance this month. CHILDREN’S MINISTER KATHERINE Zappone sought a higher figure than the €2.5 million offered by the Bon Secours Sisters for the excavation of the Tuam mother and baby home grave site. Yesterday, the minister confirmed that there will be a full forensic examination of the site of the mother and baby home in Tuam in Galway. A phased approach will be adopted which includes a forensic excavation and recovery of juvenile remains as well as the use of technology to locate potential burials. “Our approach is reasonable and it is rooted in profound empathy,” the minister said today. On-site testing will be used at Tuam to identify possible burials and arrangements will be made for respectful reburials and memorialisation, while a process of individualisation and identification of infant remains will be undertaken – where possible. Sinn Féin’s Mary Lou McDonald called the offer of €2.5 million by the Bon Secours Sisters, who were the religious order that ran the home, as wholly inadequate. The cost of the forensic excavation has been estimated at between €6 million and €13 million, but some have speculated that it could cost significantly more than that. McDonald said the Order “bears at least an equal responsibility to that of the State in respect of this scandal and should pay significantly more on that basis”. She told the Taoiseach that the religious order should pay at least 50% of the costs, while the State, who were also complicit, should pay the rest. The Taoiseach confirmed to the Dáil that the government, “through the work of the Minister, Deputy Zappone, sought a higher contribution and a percentage contribution but this is what is forthcoming”. Historian Catherine Corless, who was the first to shine a light on the burial of babies and children in an underground septic tank, said she believes the order should pay the full amount for the excavation. He added that the Bon Secours Sisters are not under any obligation to make a contribution. “We are treating it as a contribution. I want to make it very clear to everyone in the House that this is not a settlement. It is not an indemnity. It is an initial contribution to the cost of carrying out these works. The first €2.5 million will come from the Bon Secours and the rest from the taxpayer,” said the Taoiseach. The excavation and identification process “will be a very difficult operation”, he said, adding that one needs to see the photos to really understand what will be attempted. It is a mass grave. It is a very old mass grave. There are the remains of children in there. Some were still born and some were older. There may also be adult remains because it was a workhouse prior to that. It was used during the famine period as well. There are also potentially adult remains and remains from a very long time ago. When one looks at the photographs one can see that the remains are intermingled – commingled is the term they use – and a lot of them are decomposed. It will be slow and painstaking and unfortunately it will not be possible to identify all of the remains. Varadkar said it will not be possible to individualise all the remains, but added, “we will do our best”. Legislation for the forensic work will be needed and should be ready by the first quarter of next year. The Taoiseach said he wanted to manage expectations, stating that while he believes the government is doing the right thing, the works will take time. “We have not done it before in Ireland. We will have to build up the capacity to do it. As well as that, while we will do our utmost to carry out a forensic examination, individualisation and identification, in many and perhaps most cases, it will not yield a result or answers,” he said. Email “Government sought more money from Bon Secours Sisters for Tuam burial site excavation works”. Feedback on “Government sought more money from Bon Secours Sisters for Tuam burial site excavation works”.